Hall, Dr. John A. Oman VIII: The Biographical Dictionary Of British Officers Killed And Wounded, 1808-1814. London: Greenhill, 1998. 640 pages. ISBN 1-85367-315-3. £35.00/$59.95. Hardcover. In every volume of Sir Charles Oman's A History of the Peninsular War there are lists unit of the officers and men who were killed and wounded in the numerous battles of that seven year long war. Unless the reader is very familiar with the war and the many memoirs that came out of it, most of these casualties will remain nameless and thus a statistic. The newest volume to Oman's History is attempt to remedy this by bringing to light the names and personal histories of the over 3,000 British officers who were among the casualties. John A. Hall spent ten years consulting official records, casualty rolls, gazettes, memoirs, and diaries to compile this biographical dictionary. Officer casualties from any unit that served with the British ground forces in the Peninsula including the King's German Legion, the Royal Marines, and foreign regiments in British service are listed. Additionally any officer who became a casualty, regardless of the unit he was serving with could also be included, such as British officers serving in Portuguese units. All entries are arranged in alphabetical order and as a minimum include the name, rank, and date of rank of each individual; the unit he was assigned to, and the date and name of the battle in which he was wounded or killed. In many cases there are multiple dates for an individual who had the misfortune of being wounded several times! For those who survived the war, the citation often includes what happened to them after the war, medals received, whether they received a pension for their wounds and how much they received, family information, and where they resided once they left the service. The length of each citation varies, but in general is a minimum of four lines long. Many are at least a half page and some more than a page. The length of the citation is not indicative of an individual's rank, but more of the amount of interesting information that is available on him. For example the listing for General Rowland Hill, one of the foremost commanders in the British Army, is less than a half page long -- and he made the listing only because he was slightly wounded at Talavera. Yet Captain James Fergusson of the 43rd Foot, has almost a page and a half written about him. Information on him includes the fact that he was commissioned as an ensign at the age of thirteen, dates of all his promotions (he was lieutenant colonel after 13 years), a list of all the battles and sieges he fought in (21), and the severity of his four wounds. The author closes the citation with a quote from the book Die Hard: "James Fergusson of the 43rd had been severely wounded leading the stormers at Ciudad Rodrigo; with a bullet still lodged under his spine he insisted on serving at Badajoz, was wounded again on 26 March, yet with his wounds still open, he declared himself fit again to lead the stormers. (He was wounded again, but survived.)" For those who were killed, citations often include how much their personal effects were worth. The British officers had a tradition of auctioning off the effects of their dead comrades. Although to the modern reader this may be macabre, in fact it served two purposes. The dependents of the dead officer would receive some money to help them, while the officers were able to replace their own worn out items or things missing from their campaign kit that were not available otherwise. Sometimes the author lists only the value of these effects -- which ranged from less than two British Pounds to over 100 Pounds. In at least one case, the effects are actually listed and they provide a unique snapshot of what an officer carried with him on campaign. The Dictionary also includes an appendix listing some of the non-combat casualties that occurred during the war. Although the list is extensive, it specifically states that it is not definitive. It does show how dangerous campaigning could be -- for a large number of officers died from a variety of causes, and not just from battle. No one was immune for disease, accidents, and fatigue struck down both the lowest ensign and the senior officer. The official cause of death at times can be quite interesting: Major General Bock, Commander of the King's German Legion Heavy Cavalry, died in a shipwreck in 1814. Doctor G. Cabbell, Physician to the Forces died "of a putrid fever" in 1813. Lieutenant Benjamin Handley, drowned boarding a transport, in 1813. Mental illness also appeared to be a problem for some officers, for Major General Erskine committed suicide by throwing himself out a window, while General Miller died from "excessive hardships and anxiety." At least two officers were listed as being murdered, while Lieutenant Farquharson was "shot in the back by a Spanish sentry following a scuffle." Finally there was Doctor Welch who "suddenly died while eating his breakfast in a coffee house." 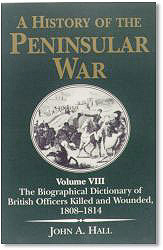 The Dictionary closes with an index of units that served in the Peninsula and a listing of the officers in that unit who were casualties. A quick glance makes it very easy to determine which units saw the most action (the Guards, the 27th, 42nd, and 43nd Foot, and of course the 95th Rifles) and those which saw very little (1st and 6th Dragoons, the 14th, 21st, and 54th Foot among others.) Unfortunately the author does not include a listing of which battles the units fought in, so the reader has to cross-reference the unit listing with the individual citations. John Hall does a superb job of documenting the human cost of the War. The individuals who fell on the fields of battle will no longer be faceless statistics in the back of a history book. The reader will know the sacrifices the men made in terms of pain and suffering and realize what how expensive their glory was. Because this type of detail is so rare, I can not recommend this book highly enough! It will appeal to both the serious historian of the Peninsular War and the casual reader of Napoleonic history.